So I have cut out the customized patterns, sewn a mock-up from non-stretch cotton fabric, and put it on the dress-form according to all rules. 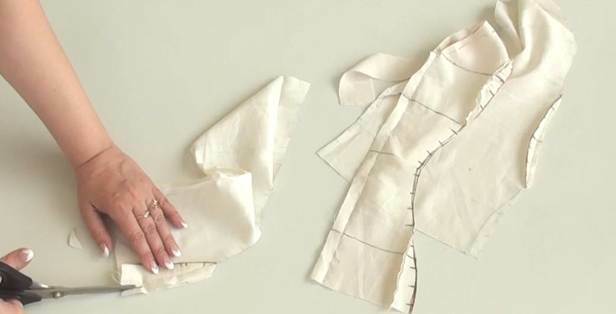 If your mock-up happens to be considerably smaller than the dress-form, just make sure the side seam runs vertically regardless of how far from the actual side of the dress-form it is placed. The edges of the back of the mock-up must also be strictly vertical even if there is a gap between them. I draw beautiful styled princess seams. They don't have to pass through the apex of the bust. You can set them closer to the center front or further from it. It all depends on what effect you want to achieve to make your client's figure better-proportioned and more graceful. Princess seams shifted toward the center will make the bust appear smaller, while princess seams shifted closer to the sides will on the contrary make it look larger. My client has small breasts, rather well-proportioned hips, and a thin waist. I feel like highlighting her thin waist and the beautiful curve of her hips while visually enlarging her breasts to make the overall silhouette more balanced. For this reason, I will shift the princess seams closer to the sides. 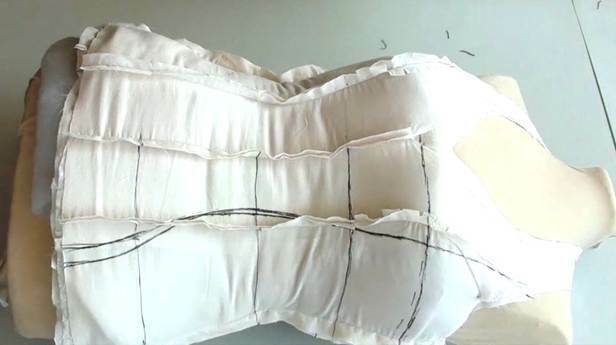 It is very important to remember that you are not supposed to place a princess seam more than 2cm away from the apex of the breast – otherwise, the whole pattern will be distorted and the shape of the cups will be affected in a bad way. I will shift either princess seam about 1.5cm closer to the side. The newly adjusted princess seams are marked red. Be as accurate as possible when transferring the princess seam line from one piece onto another with the seam allowances in the way. 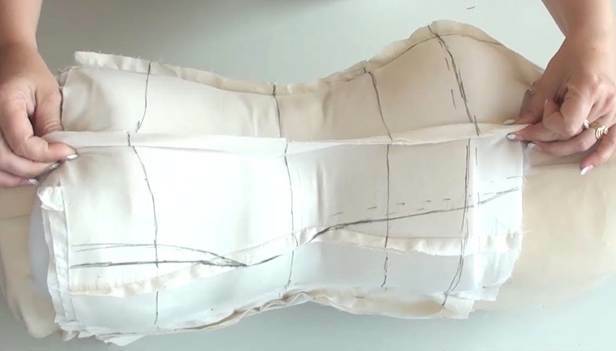 I purposely cut my central front piece as two halves instead of a single piece with a fold line so I could position it correctly on the dress-form. The back of the dress is styled in the same fashion. The princess seams will pass onto the skirt. Now let's look at the neckline. The neckline I designed on the pattern does not look good enough on the mock-up in my opinion: it is too low and I feel like changing its shape. I simply place a piece of fabric under the neckline, carefully spread it out, secure it with pins, and re-draw the neckline. Now I need to take the mock-up off the dress-form, cut it following the new lines, and try to flatten the piece with the side seam. To facilitate further work, I mark control notches all along the princess seams and not just at the level of circumference lines. These notches will be very helpful when I start aligning the pieces. I take the mock-up off the dress-form, rip it up in the middle, and cut it into separate parts. I will need to work on them additionally before pressing them. I notch the central seam allowance on the side piece and trim it down close to the stitches. I also notch all curved edges and trim all excess off the seam allowances. I also trim down the seam allowances on the central front piece and the central back piece.